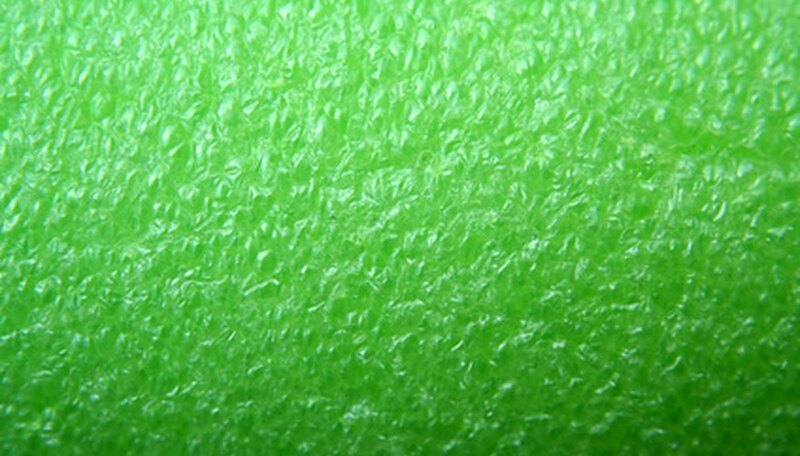 Algae on the bottom of a swimming pool can make it slimy and slick. Algae can form in a pool when there is poor water circulation or filtration, a lack of maintenance or an improper chemical balance in the water. An alga is a microscopic plant that travels through the air, water or soil, and needs water, sunlight and carbon dioxide to survive. The presence of algae in a pool is not harmful to your health and can even help the environment, but the look of it is uninviting. Test the pool's water using a water testing kit for pools, particularly to determine if you have hard, soft or normal water. Follow the directions on your water testing kit. The Top Dog Pool Supply website states that if your pool has hard water, chemical treatments would not work well to clear the algae. Use water softeners to treat hard water. Manually brush the algae from the bottom of your pool with a pool brush to help clear-up the algae better. Run the pool vacuum so it collects the algae that have settled to the bottom of the pool. Pool vacuum cleaners helps clean debris from the bottom of the pool such as dirt and twigs. Many pool cleaners are self-guided, but some models require you to guide the vacuum along the bottom of the pool. Run the pool pump and add chlorine-based shock to the pool. With most chlorine shock treatments, you use one bag of shock for every 10,000 gallons of water. However, you should always follow the manufacturer’s instructions. Allow the pump to run for 24 hours or until the water is free of algae. Monitor and clean your pool filter regularly after applying the shock treatment. Since you are killing the algae in the pool, the algae will end up in the filter. If you do not clean your filter well, the algae can return. Run the pool’s vacuum after the pool is free of algae. The vacuum will pick up any dead algae that settled to the bottom of the pool. If the algae in your pool does not clear up within 24 hours, apply the shock treatment to the pool again and run the pump for another 24 hours. According to the Swimming Pool Tips and Care website, the best time of day to add chlorine to your pool is when it is dark because you will use fewer chemicals. Sunlight can absorb a lot of chlorine, so when you add it to your pool during the day, you will end up using chlorine on a more frequent basis. When you add chlorine to your pool at night, it can clear up the water in your pool more efficiently. Top Dog Pool Supply: How Can I Remove Green Pool Algae From Swimming Pool and Spa?